Let’s start with a bit of dialogue. Me – Are you coming to Loton tomorrow? Jacqui – No, I fancy a lazy day. I’ll come on Sunday. Jacqui – Can you feed the cats before you leave? I don’t want them waking me up. Me – Not a problem. The relevance of this will become apparent soon. Last week I had a new clutch fitted in the Lotus but I only picked up up the car yesterday and there was no time to test anything. This morning I woke at 6 a.m. to find it snowing quite heavily. I stuffed all my gear into the passenger footwell, put the demisters on, the headlight on, the wipers on and headed off to Loton. (It’s all relevant). About five minutes away from Loton I was no longer able to change gear and coasted to a standstill in neutral. Then I switched off the engine. And then I was truly stuck. Flat battery. It’s now about 7.30. More dialogue? Me – Hi Jax, I’m afraid I’ve broken down. Jacqui – Uh? What day is it? Me – I’m near Loton. Can you bring the trailer? Jacqui – Uh? Haven’t you got the trailer? Me – No you’ll have to bring it. Jacqui – what time is it? So I wait patiently. Jacqui of course is hitching up the trailer and getting the whole caboodle on the road. And then who should turn up but Tony Adams. He’d already arrived at Loton but someone had told him his old car was broken down on the A458 and so he’d come to rescue me. 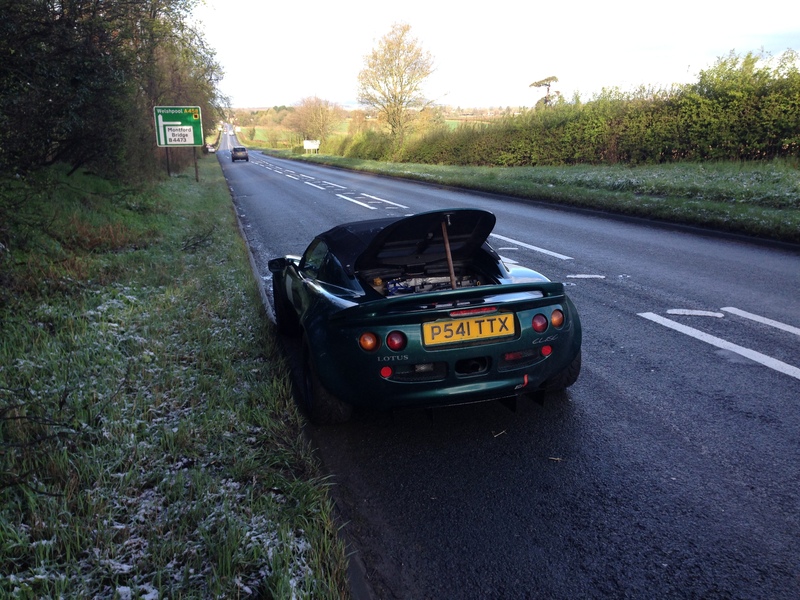 He connected the Lotus to his Range Rover with the shortest tow rope I have ever seen and we set up for Loton. I had no power and no wipers and the Lotus windscreen was soon covered in slushy muck thrown up by the Range Rover. It was the most terrifying trip I have ever had. The Lotus is then in its paddock position at Loton and various people look at it but although we can start it on a battery pack we cannot engage gears. During the lunch break we move it so it is easier to get onto the trailer but we don’t leave until mid afternoon and get back about 5pm. On the way home my wife and I have a nice chat. Me – What a waste of money. And of course I’ve already paid for tomorrow too. Jacqui – Can’t get it back? Me – Too late now… What would you think if I used your car tomorrow? Jacqui – I thought you said it wasn’t any good because it was completely standard. Me – Well… no, it would be fine and I won’t drive it very fast. Jacqui – OK. It doesn’t matter that it hasn’t got a harness or roll bar ? Me – Nah, it’ll be great. Thanks.a lot, Darling. So tonight I’ve made a timing strut for it and taken out all Jacqui’s things and tomorrow I’ll be back at Loton in the Roadgoing up to 2 litre class. Should be fun! Jacqui – You’re not racing next weekend, are you? Me – No. Prescott next weekend but I’m not entered. Jacqui – Do you fancy going to stay with my Mum? Me – Hey, that sounds great!